A four pack of dog birthday candles that are bone shape. These are the perfect birthday candles for your dog's birthday cake or a puppy party you may be planning for a boy or girl's birthday or just a dog lover. 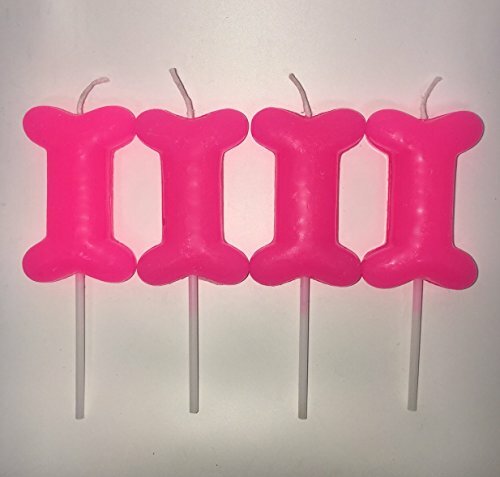 We love this dog bone shaped birthday candle in a bright pink. We sell these bone shape dog birthday candles in four colors: blue, red, white and pink. Pawsome Doggie is the only store selling these best birthday candles in these colors online. GENEROUSLY SIZED: You get four big (4 inches tall!) bone birthday candles. NEW SECURE PACKAGING! ORIGINAL: Perfect birthday candle for a puppy party as it is shaped like a dog bone treat (but it's not edible). We are the only store selling this candle with the extended stick. We had them custom made just for us. VERSATILE: We have this unique candle for doggie cakes in these colors: white, red, pink and blue. PRACTICAL: Long stick keeps bone shaped birthday candle off cake while burning. If you have any questions about this product by Pawsome Doggie, contact us by completing and submitting the form below. If you are looking for a specif part number, please include it with your message.